I want to send a big thank you to Dr. Gina Tranquillo for the work she does and the healing she provided for my dear corgi, Riley. In April 2017 my corgi became paralyzed and was in pain caused by a spinal injury. We couldn’t pinpoint exactly what caused his injury, we only knew by his x-rays that he had two affected discs. He possibly had IVDD (inter-vertebral Disk Disease), he could not walk on four legs, while he would drag the back two. I was given two paths to choose. One was surgery which would include $2,000 MRI and as much as $6,000 for the surgery itself. There was no guarantee I would get the results I wanted. I had to decide quickly if I wanted to go with surgery as there was a small window of time that I had to make my decision. The second path was the conservative route. He would be placed on crate rest and pain relievers such as tramadol and carprofen, an anti-inflammatory, with a small amount of hope for complete recovery. I chose the conservative route. While Riley was on crate rest and prescription medication, I had to carry him everywhere, including outside to do his business. He was miserable and depressed, and clearly not comfortable. I decided I would investigate complementary and holistic methods of healing. I found Dr. Gina Tranquillo, VMD at All Points Equine LLC and made Riley’s first appointment for acupuncture. Dr. Gina was gentle and caring with Riley. She studied his x-rays, the notes from his regular vet, and asked me a lot of questions about his demeanor and preferences. After the first session of acupuncture, I saw a small improvement in Riley. Dr. Gina also placed Riley on several nutritional supplements to help the healing process. After the third acupuncture session and four weeks of nutritional goodness, he was no longer exhibiting pain. After six weeks and four acupuncture sessions, Riley started to move his hips as he would drag his little body around the yard to do his business. Then, after five acupuncture sessions, and eight weeks since he first went paralyzed he stood up on all four legs. I was thrilled! I am writing this review in the fourteenth week of Riley’s recovery, and presently Riley is doing very well. He is walking and running on all four legs. When he goes outside he runs up the hills, hikes to the far reaches of my property, jumps up the four steps leading to my back deck and stands on his hind legs while begging me for whatever it is I might be eating. He appears to be completely back to normal – perhaps better than normal. “I have known Dr. Forbeck Ramig for many years and in that time I have found her to be a compassionate professional, a person who not only understands what is going on with my horse, Angel, but what is going on with my horse’s “pet”, me. She can read my mind as well as Angel’s, which reduces the stress of a non-routine visit, of which Angel has had a few. 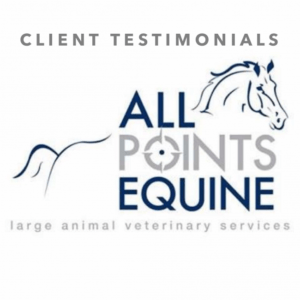 Routine trips to vaccinate, check teeth, and the like, are performed as if my horse is the only horse on the planet – special attention to Angel’s particular quirks are Dr. Ramig’s specialty. Dr. Ramig stays focused on the entire “patient”, meaning I’m part of the package, which is important to the continued well-being of Angel. Dr. Fenstermacher has also treated Angel in an emergency setting. Her calm appraisal of the situation restored my equilibrium so that I was able to fully appreciate what was taking place, and what I had to do to facilitate Angel’s quick recovery. Her routine examination of another horse of mine was performed completely, in a timely manner, taking in the entirety of the horse during a short period of time. This is ability is very important, especially if you are the next client on the list. We have been seeing Dr. Gina since October 2015 mainly for our girl Lucy’s UTI problem. We saw how acupuncture helped our now-late furbaby Cuddles before, so we were really excited about this opportunity here in the Lehigh Valley. Dr. Gina always makes sure Lucy is ok, goes through her medical reports if there is a new one. We discuss how Lucy has been since the last appointment and what we can do until the next one. When we couldn’t make an appointment in the summer and Lucy got another UTI, she responded to our email right away and we made arrangements so that Lucy got her treatment sooner than her next scheduled appointment. In fact, she always responds our emails very quickly as she realizes if it wasn’t a concern about our girl’s health, we wouldn’t send her an email even on the weekends. Her calm but cheery demeanor helps Lucy not to get too excited during her treatment sessions. We are extremely happy that Lucy is in good hands. If your furbabies haven’t seen Dr.Gina and/or Dr.Kristen yet, they and you are missing a big opportunity towards bettering their health. – Yesim E.